H x W x D (in inches): 27 3/16" x 23 3/8" x 23 1/4"
Inspiration Wine Cabinets by EuroCave. Are wine cabinets that are designed primarily for kitchen or open plan concept rooms. The cabinets can be fully built-in or flush-fitted; this allows your wine cabinet to seamlessly blend in the living or kitchen space. This page is still being developed - Information may change. Maximum number of sliding shelves per cabinet is indicated per the individual product. Service Shelves is presentation rack within the cabinet. Narrow depth cabinets up to 89 bottle capacity. 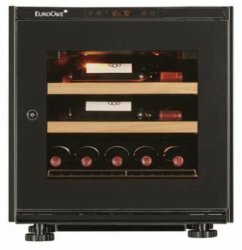 built in or fully integrated flush mount wine cabinet.